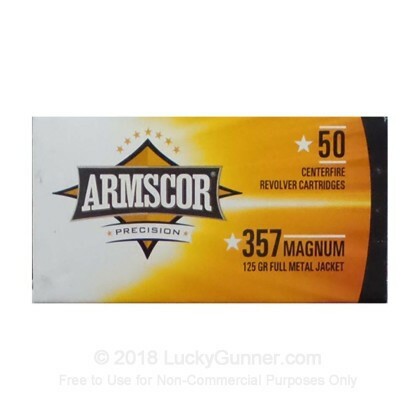 This highly regarded 357 Mag ammunition is competitively priced, made of quality components and is new production, non-corrosive, in boxer primed, reloadable brass cases. I was drawn in by the low price of this ammunition and I have to say, "You get what you pay for." I bought 100 rounds of this to try it out and was VERY disappointed. One failure to fire out of the first box of 50 and two failures to fire out of the second box. All three had deep, solid primer strikes and more than one attempt to fire them was made. I was shooting my Ruger GP100 that has never had a problem with any other brand of ammunition. In addition, this ammunition is VERY dirty. It'll probably take me an hour to clean all the snot off that the 97 rounds left on the cylinder face. I'm afraid what what else awaits me when I clean my gun. Finally, the loads seem very inconsistent. Aside from the 3% failure rate, some rounds were very "hot" while others were iust "meh".